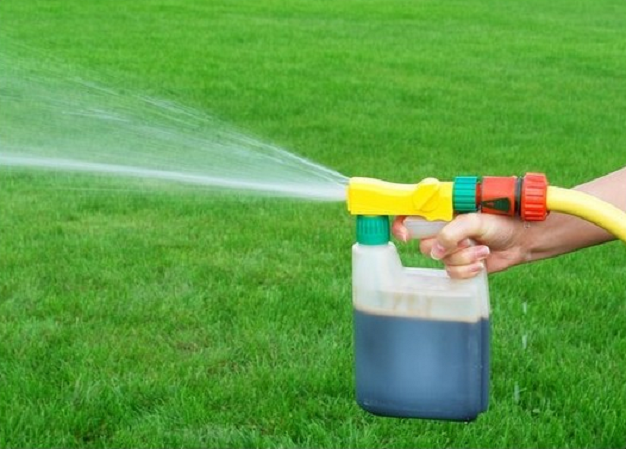 Liquid lawn fertilizer is fantastic for shrubs, trees, and grass. They help facilitate strong plant growth, build strong root structure, decrease potential heat stress, and even protect against frost damage. Liquid lawn fertilizers are absorbed into the plant through their leaves, like nutrients from rain. This enhances the appearance of your greenery, by delivering nutrients first to the leaves and traveling through the plant to the roots. It’s in a spray form; it offers a reduced possibility of burning due to the greater coverage. The application of a concentrated liquid lawn fertilizer is as easy as turning on a garden hose and not as challenging as various other forms, like evenly spreading a solid fertilizer. The outcome of a spray fertilizer for lawns is quick. If you use a liquid lawn weed and feed, it will protect against weeds while building a strong root base. Some liquid fertilizers contain a liquid lawn seed concentrate, which can help you when planting grass to build a lush green lawn. If you don’t own a garden hose, it isn’t possible to use a liquid fertilizer. Concentrated liquid lawn fertilizer can have a high price tag to buy enough to cover your yard. Spray fertilizer for lawns scatter it into the air, which can result in particles evaporating before they get to the roots. These types are created with matter that once was alive, such as plant matter, or is created from living things, such as manure. Either substance can be used to make an organic liquid fertilizer for a natural lawn care method. Be aware, many organic liquid lawn fertilizers can have a strong odor, but it quickly dissipates. These types are made of chemical compounds, often mixed specifically for your lawns needs. These will often come in the form of a liquid lawn weed and feed, so besides making the plants stronger, they also kill weeds. A synthetic spray fertilizer for lawns is chemically designed to also help fight disease in your lawn. Garden Hose Attachment: This is a bottle or nozzle with refillable bottle that screws onto the garden hose, which you then stand around to spray liquid fertilizer on lawn. Sprinkler attachment: This is a bottle that attaches to your faucet nozzle then you connect your hoe to it, so that when you turn your lawn sprinklers on, it will automatically spray liquid fertilizer on the lawn. As you can see there are many different delivery methods for liquid lawn fertilizer, along with many different types of liquid fertilizer for lawns, such as synthetic and organic liquid fertilizer. For quality lawn care to fully revitalize your lawn, use a liquid lawn weed and feed or a liquid lawn seed concentrate, both synthetic liquid lawn fertilizers will do more than just assist in growing grass but will also kill weeds or create dense grass. For a more natural lawn care, use an organic liquid fertilizer, which is done without chemicals, so your lawn will be safe for your children to play in. If interested in transplanting trees, plants, or bushes around your yard, learn more about soil. I hope you have gained a greater understanding of liquid lawn fertilizers, and how they can help your yard be the envy of the neighborhood.